Star Team Award 2018 - Gwent branch is one of the 3 finalists!! Wish us luck everyone and thank you to all who voted for us. As the excitement builds and we draw closer to the National Cat Awards 2018 we need your help to choose the winner of this year’s Star Team Award. The category celebrates a team of Cats Protection volunteers which has brought about a particularly positive result for cat welfare. All three finalist teams will be joining the owners of cats in the running to be named National Cat of the Year at a star-studded awards ceremony, sponsored by PURINA®, at the Savoy Hotel in London on Thursday 2 August 2018 when the winners will be announced. 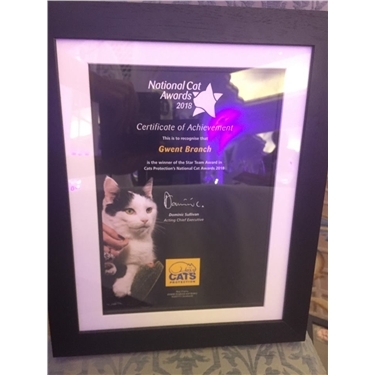 Further information is available from nationalcatawards@cats.org.uk or by calling 03000 12 12 12.